It has been an interesting couple of weeks. We hunted around the various caravan shops and repair places to find someone to build us a stone guard for the front of the camper. We want to protect the front of the camper from wild and woolly rocks that have the potential to bounce and damage. Referrals led us to Clarkey in a nearby suburb. After much head scratching, ummming and ahhhing, a design was agreed upon. It was the first time that Clarkey had built such a thing, but he’s a retired truckie with a passion for aluminium welding. As part of the familiarisation process, we obliged by discussing (at length) and inspecting his collapsible boat trailers and various other innovations that are in the pipeline. Fast forward a week and I receive the call: the prototype is made, bring in the camper for a fitting. It was a lovely design: aluminium tube frame that had been through the pipe benders – nice rounded corners. One moulded piece of aluminium checkerplate welded to the front of the frame. Only one problem – the guard was too narrow for the width of the camper. Fast forward another 24 hours: Stone Guard II is ready. But Clarkey had a few ‘issues’ with getting all the angles right through the pipe bender and so the final result was an asymmetrical stone guard. Time to move to Plan B. With some more research and advice, we have opted for the Stone Stomper. 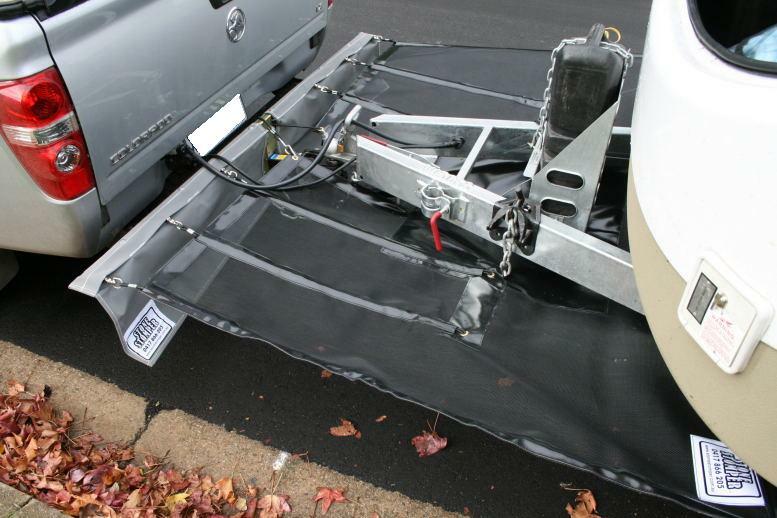 A flexible screen that joins the underside of the camper to the underside of the rear of the car. Much less complex. Ordered yesterday, made to measure today, on the courier tomorrow, here early next week.